The fast pace of golf course and swimming pool construction in the 1970s dramatically altered the American landscape. The biomorphic sand trap and the suburban kidney-shaped swimming pool set precedence for new forms in an ever-changing landscape. Rectangular planting beds and straight lines were discarded for the curve. Simple flat green lawns were dug up and in their place architects mimicked the putting greens of miniature golf courses with raised mounds of soil and snaky contours. Formalism was tossed out and the swinging curve was in. 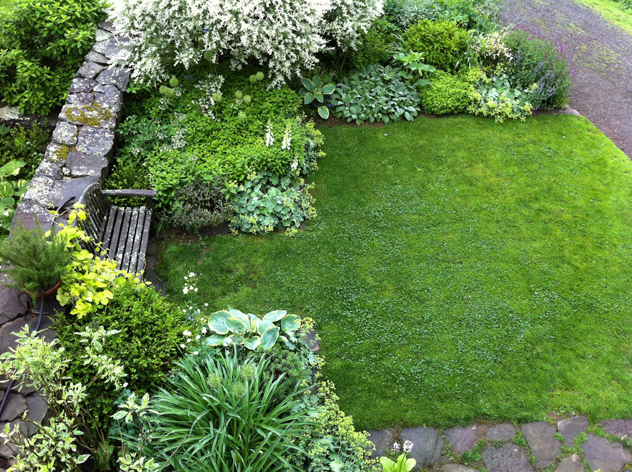 The residue of this period can still be seen in the garden choices for many homeowners. I guess it was an inevitable part of the evolution of a culture that is wild about change. I don’t think the forced curve works except in a large landscape, and even then it’s difficult to implement. Many suburban neighborhoods were laid out in a grid with boxy houses. Winding roads leading to cul-de-sacs were thrown into the mix like spice into leftovers. Overnight the planting beds surrounding a house looked more like a plate of spaghetti than a home for plants. By making the planting beds curvy, the homeowner competed with the natural shapes of the trees and shrubs and thus robbed the plants of their special qualities. Over time plants naturally take on a similar form. The undulating lines of trees and shrubs contrasted against a formal geometry are pleasing to the eye. My favorite gardens have that element of combining the controlled and the wild. The biggest problem with planting is when there is a lack of unity, repetition of plants, or consistency. 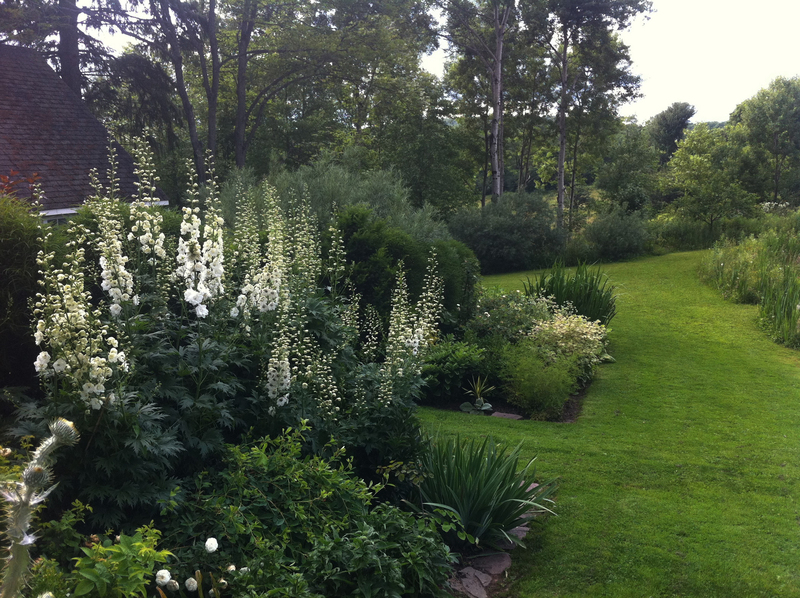 Gardens are successful when plants are repeated, or a palette of plants is repeated. When there is no cohesive element tying the garden together, plantings look disjointed, much like fast-food restaurants dotted along a strip mall. In East Hampton on Long Island tall privet hedges are planted everywhere for privacy, but they also act to unify the coastal suburban landscape. The dark green hedges make a perfect backdrop for plants. In most natural settings a small selection of plants predominate the landscape. Here in the northeast the maple has been the tree of choice. Whether lining city streets or country roads to the town square, this tree has withstood, in Yankee tradition, many horticultural trends. On New York City’s Fifth Avenue the classical building foundations are dressed in boxwood, yews, hollies and rhododendrons, all evergreens, which presents a unity from building to building. Rhamnus Fineline hedge creates formal backdrop to planting, paths contrast straight lines to loose planting. I travel all over New York State to see gardens and while driving recently on the Long Island Expressway, I noticed the new plantings alongside this highway. In the median of the freeway is a bizarre construction of cement bollards which contain butterfly bush, and on the sides enormous prefabricated walls were erected to protect suburban neighborhoods from the noise and visual assault of the highway. Planted at the base of these towering seagull-mural-walls are hundreds of shrubs of forsythia, which crash against the hillside like an enormous yellow wave. I am sure many accidents have occurred by drivers being blinded by the yellow flower overkill. I wonder who made the aesthetic choices for one of the busiest roads in America? In Freeways (1966) Lawerance Halpin wrote, “Freeways out in the countryside, with their graceful, sinuous, curvilinear patterns, are like great free-flowing paintings in which, through participation, the sensations of motions through space are experienced.” Interstate 87 and 88 which are heavily traveled roads through the Catskills achieve this. When plantings are added to these two interstates they seem to incorporate existing species of plants. Though these highways do not have encroaching communities butted up against them, I think there is a lesson to be learned by landscape architects in going back and looking to these more natural plantings. I love looking at the working farms, and orchards along these highways. There is tranquility in driving these roads. Don’t get me wrong; curving lines can work well in a garden. I prefer a driveway that has some curve to it rather than a straight road. A mown path that weaves through high grass adds interest and mystery to the garden. Curves are an important garden element when used sparingly. 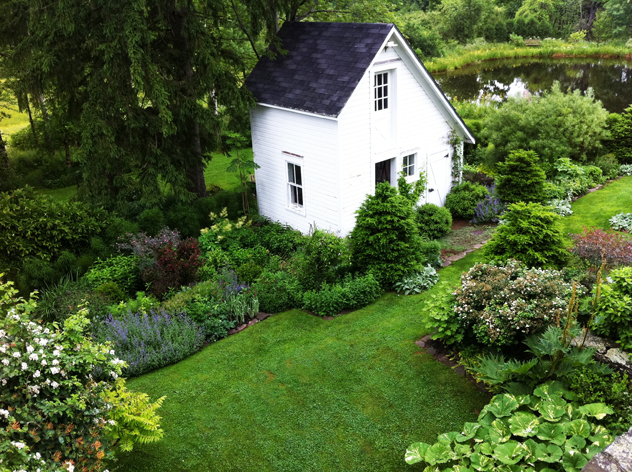 Begin with formal shaped beds, especially near buildings and structures. Once planted, the very same rectangular planting beds over time will loose the formal shape and take on their own natural form. For hundreds of years designers have used the concept of a house having rooms and extended this concept outside into the garden so that the transition from structure to landscape feels less abrupt. As we move away from the house there is less need for formality. The middle ground between structures and the existing landscape need to meet seamlessly. Plants spill softing formal lines of borders.